My sister was being eminently sensible when she planned not to date until her junior year of college. She’d seen the struggles Michael and I went through because we start dating so young, and (wisely) didn’t want to go through the same things herself. Frankly, it seemed like a smart decision to me. But even then, three years ago, I knew that God sometimes has plans for us that we don’t anticipate, and I wondered what would happen in spite of her resolve. One her first day at college, Rosie fell down at Anthony’s feet. Literally – they were playing soccer or frisbee or something, and she slipped on the grass. Although he doesn’t particularly remember helping her up (being on the orientation team, he’d met a lot of people that day) he recalls noticing her over the coming weeks. I wasn’t going to school with them that semester (I transferred the following January), and my sister was reluctant to mention him, but at a school with only 250 students, the slightest interest does not go unnoticed, and so I heard his name from Rosie’s roommates. Asked about him, she talked a little, but her struggle was mostly internal. She was a bundle of contradictions, still mostly convinced that her resolution to put off dating was the right decision, but attracted to Anthony nonetheless, and also fairly sure that he wasn’t interested in her anyway. I’d never met him, but somehow, from the first moment I heard his name, I knew that she had nothing to worry about, that he was interested. And sure enough, he was. My sister may have been surprised when, in February, Anthony approached her about dating. Even though I’d only met him a time or two by then, I wasn’t surprised at all. Things developed gradually. I think they had their first date that March, and he came to my parents’ house that spring for Easter, meeting our family for the first time. They were both a little shy, a little nervous together, but I thought the prognosis was good. I’d be lying, though, if I said their courtship went smoothly the whole way. 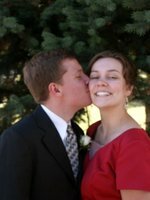 They spent that summer (of 2003) on opposite sides of the country, and in the fall he had an exchange semester in Austria, planned before he knew my sister. When he was in Austria Rosie went through a tough time. That November they decided (read: she decided) to make their emotional status match their geographical status, and take some time apart. In January of 2004, Anthony was back in town, annoyed with my sister and determined (he says) to have nothing to do with her. But Rosie (he admits this now) is pretty irresistible, and by the end of that semester their relationship was back on good, if tentative, footing. We took a trip up north with them that May, and although I’d had the feeling all along, that was the first time I knew they were meant for each other. Often in spite of themselves, their joy in each other was palpable. In the fall of 2004, after another summer apart, the two headed down together to school in Florida. Desperately homesick and depressed, Rosie had a rough time of it during her first few months there, and so did their relationship. I spent hours on the phone with her, consoling her and sometimes challenging her. I can’t pretend that going through the emotional wringer with her was always easy for me. But for the most part, I am deeply grateful when I have a chance to be there for my dear ones. And counselor seems to be a role I fall into naturally (see Rosie’s shirt in the picture below). As ought to be apparent from the end of the story, eventually they made it. Although I always knew that it should happen, I was often afraid that it wouldn’t, but Rosie called me, out of the blue, on the evening of February 16th, to tell me that they were engaged. She was emotional and a little scared, but I felt a sudden lightness in my chest that spoke of the difference between praying and being fairly certain that something will happen, and suddenly being sure that it will. The transformation in Rosie and Anthony during their engagement was amazing. They’d been praying hard for months, and when they got engaged they both knew that it was the right thing. But she was still shaky and depressed, and I imagine that dealing with that was not entirely easy for him. However, by the time I flew down to visit in March, I could already see their joy budding. It was if making the decision to get married had moved them into a new period of their lives, a period where uncertainty had been banished and the future could be welcomed openly, smilingly. By May, with two months to go, they were both impatient for their wedding day, ready to start their life together. It felt, to all of us, that July 23rd would never come, but of course it did. Rosie asked me to be her matron of honor (she was maid of honor for me, and I’ll show you pictures from our wedding someday, when I remember to take them to my parents’ house and scan them). I was glad for the chance to take care of my little sister on one of the biggest days of her life. At the reception, a family friend of Anthony’s came up to them and told Rosie that his favorite part of the wedding was watching her sisters’ faces as she came down the aisle. “They were all beaming,” he said. And we undeniably were, for a better thing has never happened to our sister. It was a glorious day. Both families rejoiced together in the joining of two people we love so much. They’re on their honeymoon now, but when they return they’ll be living in a little apartment two miles from our house. We can’t wait to have them nearby. Meanwhile, I’m still praying for Rosie and Anthony, just as I prayed for them constantly during their engagement. I pray especially that their children may come quickly and easily. I pray that their life together may be filled with countless other blessings. And I pray that they may find the same solace in each other that Michael and I do, that they may thank God for their marriage as I thank him for mine every day. If there’s one thing of which this whole wedding has reminded me, it’s how blessed I am. Congratulations to your sister - I wish her many years of wedded bliss! Best wishes to your sister - she looks lovely in the photographs! (As do you - your dress is the same colour my sister's was when I got married and she was maid of honour :)). And I'm hoping with you that their path to children is smooth and straight. Awww, congratulations to Rosie! The two of them look so happy together. I eagerly await pictures of your own wedding, should you ever be inclined to put some up. Congratulations to Rosie. She was a beautiful bride! You were a lovely matron of honor too! We would love to see pictures from your wedding. What beautiful pictures and a beautiful portrayal of their story! Thank you for sharing. Thanks for sharing such a beautiful story! I truly wish I had been as fortunate as your sisters in having a wise and loving older sister. I am so glad to have found your blog. I am also a practicing Catholic struggling with infertility. I read many blogs that deal with infertility, but yours is the first that shows the Catholic point of view. I found your blog a few days ago from a link off of another blog, so I haven't been reading long. I look forward to getting to know you better..... Thanks for your honesty and willingness to share your journey. Congratulations and blessings to Rosie and Anthony, and to all of you who love them. She is indeed blessed to have a sister like you.